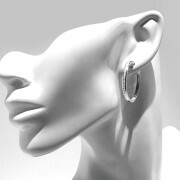 A pair of 18ct white gold channel set diamond hoops. 21 round brilliant cut diamonds are channel set into the front of each hoop. Total of 42 diamonds, adding up to a total weight of 1.14ct.